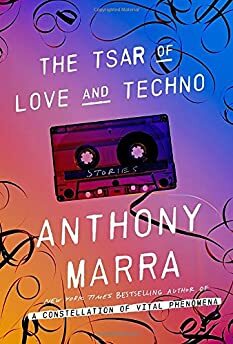 Largehearted Boy: Book Notes - Anthony Marra "The Tsar of Love and Techno"
Book Notes - Anthony Marra "The Tsar of Love and Techno"
The Tsar of Love and Techno, my new collection of tightly intertwined stories set over nearly a century of Russian history, is structured as a mixtape. There’s a Side A, Side B, with an intermission between serving as the tape flip. To my mind, a mixtape is organized similarly to a good story collection. You’re not simply collecting a series of songs or stories you like, but rather you are engineering an emotional narrative. Much of my adolescence was spent hunched over a Sony cassette deck, making mixtape for crushes. While none were particularly successful, I see them as one of my first attempts at narrative making. After finishing The Tsar of Love and Techno, I decided to create a mixtape for it on Spotify. Below are my thoughts on some of the tracks. Tchaikovsky’s music appears several times throughout the collection and plays a pivotal role in several character’s lives. A young man in an Arctic mining town is sweet on a classmate and invites her for an evening stroll. When he learns that she is struggling with the expectations of being the granddaughter of a renowned prima ballerina, he trumpets the famous melody from The Nutcracker and begins dancing with her. One of my goals in this book was to see how history is reformed and repackaged to fit the contemporary moment (one story, "A Prisoner of the Caucasus" is an updated version of captivity narratives that Pushkin and Tolstoy wrote under the same title). So I wanted to find a remixed version of this Russian classic. To my surprise, Spotify has no shortage of Tchaikovsky electronica. "Kalinka" is a classic 19th-century folksong, among the most famous and recognizable Russian songs of that era not written by Tchaikovsky. This remix turns the classic is to a boozy contemporary party anthem. As with the previous entry, I love how this old tune has been retrofitted for the desires of a new era and generation. What was once sung among peasants (think of Natasha’s peasant dance scene from War and Peace) is now sung at penthouse parties. If you’re on Spotify, look up the various versions of this song. Hearing the Party Factory remix beside the Red Army Choir version is a tour of 20th century Russian cultural change, in under ten minutes. I first heard this song during a long winter in St. Petersburg and I remember walking along frozen canals, listening to it on my headphones on repeat. If sunlight were a song, this would be it. It might have the most infectiously poppy hook I’ve ever heard. For years afterward, it was ubiquitous on American dance floors and in house parties, but whenever I hear it I think of long winter nights in Petersburg, where a number of these short stories unfold. One of the trickiest aspects of constructing any mixtape are the transitions between songs. The Algar Pool version of Swan Lake’s theme sounds like it's conducted by a phantom inside an abandoned theater and in the final moments the strings fall silent and the melody is carried to its conclusion on one-handed piano line. The next track is by Neoclubber, one of the few Russian dance acts to receive some modest attention in the West. It’s gloriously cheesy. Galina, the aforementioned granddaughter of a prima ballerina, dances Swan Lake on the stage, but I suspect she’d much rather be dancing to Neoclubber. I love how these two tunes couldn’t be more different, yet at that moment of transition between the tracks, when the ethereal piano of Tchaikovsky gives way to Neoclubber’s synthesizer, they seem to fit together like two perfect puzzle pieces. Two brothers in Tsar live in their father’s air and space museum and spend their childhoods dreaming of becoming cosmonauts. Like them, I was and still am a complete outer space nerd, and this M83 song always makes me think of space flight, not just because M83 takes its name from a nearby galaxy. "We Own the Sky" has a soaring, interstellar quality that suggests the awe and escapism these two brothers seek. I’m particularly pleased with these last three tracks, which speak to the final story in the collection, "The End." That story is set in a space capsule at the edge of the solar system, and because it was one of the first written in this linked collection, I tried to orchestrate a sense of anticipation throughout as the book moves toward these last few pages. The cosmonaut in question has no companionship but radio static—that sense of isolation is beautifully mirrored in "FM" and "Outer Space Pilot." When he finally listens to the mixtape he’s been carrying with him across the entire solar system, he hears a song that brings him back home.